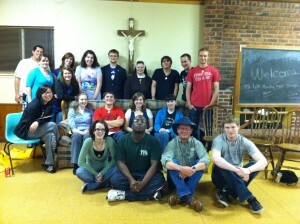 I had a great time speaking to my daughter Emily’s friend at the Madonna University Kairos’ group. Great bunch of college students concerned about the most important thing in life – God! My daughter Emily is 4th from the left standing, leaning forward and smiling. Welcome, Steve, and particularly Emily and co-retreatants! I work at this retreat center and hope you all have a God/Jesus/Spirit-filled weekend! Previous post: Jesus Will Return May 21, 2011 … Rats! And I Had Plans!